Scientists at the University of California-Santa Barbara (UCSB) and the University of Toronto have discovered that patients with an inherited kidney disease may be helped by a drug that is currently available for other uses. The findings were published online on October 24, 2011 in the Proceedings of the National Academy of Sciences. Over 600,000 people in the United States, and 12 million worldwide, are affected by the inherited kidney disease known as autosomal-dominant polycystic kidney disease (ADPKD). 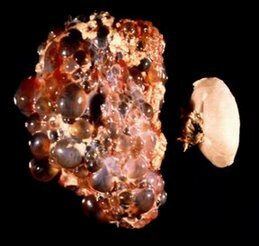 The disease is characterized by the proliferation of thousands of cysts that eventually debilitate the kidneys, causing kidney failure in half of all patients by the time they reach age 50. ADPKD is one of the leading causes of renal failure in the United States. "Currently, no treatment exists to prevent or slow cyst formation, and most ADPKD patients require kidney transplants or lifelong dialysis for survival," said Dr. Thomas Weimbs, director of the laboratory at UCSB where the discovery was made. Dr. Weimbs is an associate professor in the Department of Molecular, Cellular and Developmental Biology, and in the Neuroscience Research Institute at UCSB. Recent work in the Weimbs laboratory has revealed a key difference between kidney cysts and normal kidney tissue. They found that the STAT6 signaling pathway –– previously thought to be mainly important in immune cells –– is activated in kidney cysts, while it is dormant in normal kidneys. Cystic kidney cells are locked in a state of continuous activation of this pathway, which leads to the excessive proliferation and cyst growth in ADPKD. The drug leflunomide, which is clinically approved for use in rheumatoid arthritis, has previously been shown to inhibit the STAT6 pathway in cells. Scientists have identified the genetic blueprint of the giant intestinal roundworm, Ascaris suum, revealing potential targets to control the devastating parasitic disease, ascariasis, which affects more than one billion people in China, South East Asia, South America, and parts of Africa, killing thousands of people annually and causing chronic effects in young children. Dr Aaron Jex and Professor Robin Gasser, both from the University of Melbourne's Faculty of Veterinary Science, led the international research project, the results of which were published online on October 26, 2011 in the journal Nature. The work has provided new insights into how to treat ascariasis, identified by the World Health Organization as a key, neglected disease in urgent need of extensive research and significantly improved control. "Sequencing the genome of Ascaris suum is a major step towards controlling the infection it causes because the more we know about the genetics of the parasite and how it works, the better we can fight it with novel treatments," Dr. Jex said. "From the genome sequence we have identified five high-priority drug targets that are likely to be relevant for many other parasitic worms. New treatments are urgently needed and genome-guided drug target discovery is ideal for identifying targets that selectively kill the parasite and not the host. We also identified key information on how the parasite hides from the immune system, which is essential for any future vaccine development." The team sequenced the nuclear genome of Ascaris sum, which is an easier worm to study in the laboratory and mainly only infects pigs, but is very closely related to Ascaris lumbricoides, which causes ascariasis in humans. 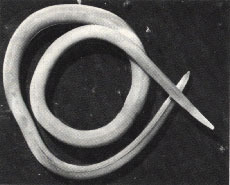 The worms range from 15-30 cm in length and are spread via eggs in contaminated food. A surprising new University of Colorado-Boulder study shows that huge amounts of fatty acids circulating in the bloodstreams of feeding pythons promote healthy heart growth, results that may have implications for treating human heart disease. CU-Boulder Professor Leslie Leinwand and her research team found the amount of triglycerides -- the main constituent of natural fats and oils -- in the blood of Burmese pythons one day after eating increased by more than fifty-fold. Despite the massive amount of fatty acids in the python bloodstream, there was no evidence of fat deposition in the heart, and the researchers also saw an increase in the activity of a key enzyme known to protect the heart from damage. After identifying the chemical make-up of blood plasma in fed pythons, the CU-Boulder researchers injected fasting pythons with either "fed python" blood plasma or a reconstituted fatty acid mixture they developed to mimic such plasma. In both cases, the pythons showed increased heart growth and indicators of cardiac health. The team took the experiments a step farther by injecting mice with either fed python plasma or the fatty acid mixture, with the same results. "We found that a combination of fatty acids can induce beneficial heart growth in living organisms," said CU-Boulder postdoctoral researcher Dr. Cecilia Riquelme, first author on the research article being published in the October 28, 2011 issue of the journal Science. In addition to Drs. Leinwand and Riquelme, the authors include CU postdoctoral researcher Dr. Brooke Harrison, CU graduate student Jason Magida, CU undergraduate Christopher Wall, Hiberna Corp. researcher Dr. Thomas Marr, and University of Alabama Tuscaloosa Professor Stephen Secor. Medical researchers at the University of Alberta in Canada have discovered a potential new drug target for multiple sclerosis (MS) that could prevent physical disability associated with the disease, once a new drug is developed. In the first phase of MS, those with the condition have significant inflammation of their brain cells, resulting in continuous cycles of inflammation attacks followed by recovery periods. In the second phase of the disease, the inflammation isn't as severe, but this is the stage where physical disability sets in due to the effects from substantial numbers of brain cells having been killed in the first phase of the disease. When immune cells become active due to inflammation, they can pass through the blood-brain barrier and enter the central nervous system. Some of these activated immune cells secrete a molecule, known as granzyme B, that can get inside neurons and wreak havoc – ultimately causing brain cell death. Granzyme B is found in MS brain lesions – especially in the early stages of inflammation. This molecule can get into brain cells through a "gatekeeper," known as receptor M6PR. Researchers with the Faculty of Medicine & Dentistry at the University of Alberta discovered in lab experiments that if they prevent this granzyme B from entering neurons, "we can also prevent the killing of neurons," says principal investigator Dr. Fabrizio Giuliani, whose team’s work was published online on September 30, 2011 in The Journal of Immunology. "It is this loss of brain cells, in the long-term, which induces disability in those with MS," Dr. Giuliani says. "This is a new drug target for MS that is specific for the neurodegenerative processes following inflammation." Dr.